Click any image to view larger. This crisp Trappist Belgian Tripel Ale (ABV 8%) is a hazy light orange; its fine head complements an aroma of fresh hops and yeast. Its flavor combines a touch of hoppy bitterness with notes of cloves and raisins. Top fermented and refermented in the bottle, Chimay White (Cinq Cents) ages well and can be cellared for at least five years while maintaining quality. 11.2 oz (capped) bottles. 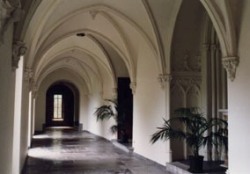 Scourmont Abbey (Abbaye Notre-Dame de Scourmont) is a Trappist monastery on the Scourmont plateau of Belgium. 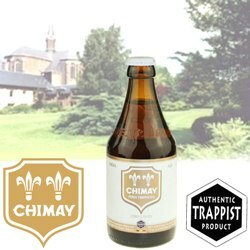 The abbey is famous for its spiritual life and for its Chimay beer, brewed within the monastery under the control and responsibility of the monastic community. 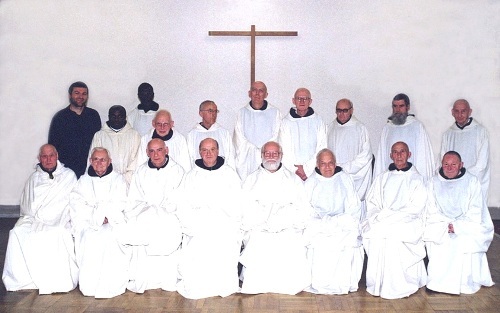 Life in the abbey is characterized by prayer, reading and manual work, the basic elements of Trappist life. In 1844, Jean-Baptiste Jourdain, the priest of Virelles, suggested that the wild plateau of Scourmont was a suitable place for a monastery. However, all previous attempts to cultivate the barren plateau had failed. Fr. Jourdain obtained support for the proposed foundation from Prince Joseph II de Chimay and the abbots of Westmalle and Westvleteren Abbeys. Six years later, in 1850, a small group of monks from Westvleteren settled on Scourmont and founded a priory (raised to the status of abbey in 1871). Hard work was required to transform the barren soil of Scourmont into fertile farmland. A cheese-making factory and a brewery were also built in order to meet the needs of the abbey and its foundations as well as to sustain employment in the region. All production respects the great monastic brewing tradition and takes place, even today, despite increased production, in the original abbey buildings. Since its renovation in 1989, the brewery uses modern technology to back up traditional brewing knowledge that dates back to 1862. The water for the beer is drawn from a well located inside the monastery walls. The filtered solids from the beer mash are recycled into livestock feed which is given to the same cows that produce the milk for Chimay cheeses. Even though the brewery only operates from 7AM to 4PM out of respect for the schedule of monastic life, it produces two 250 hectoliter (52,850 pt) batches daily. 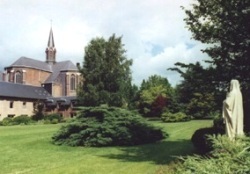 As with all other Trappist breweries, the beer is sold only for financial support of the monastery and its charities. The brewery business pays rent for use of the property within the abbey, which is used to support the monastic community. All of the profit from the sale of the beer is distributed to charities and for community development around the region.